Helon Habila’s third novel explores militancy and petrol-politics in Nigeria’s Niger Delta—International cause célèbre following the 1995 extra-judicial killing of environmental activist Ken Saro-Wiwa. 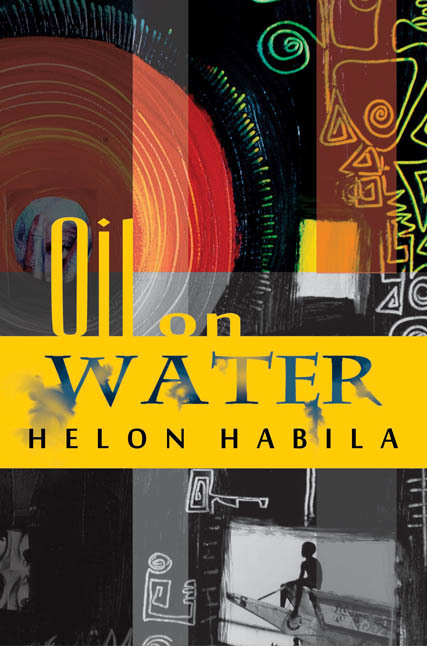 Told in Habila’s award-winning prose, Oil on Water follows two journalists, the younger Rufus and the more experienced Zaq, in a descent through the creeks of the delta to unravel the story of the kidnapped expatriate wife of an oil company executive. . .
“As they struggle up the river in a canoe, guided by an old man and a young boy, the reporters encounter nightmarish scenes of devastation: ‘dead birds draped over tree branches, their outstretched wings black and slick with oil; dead fishes bobbed white-bellied between tree roots’. By the flickering light of oil flare, they find some villages abandoned, their fields and water contaminate; others scrape a miserable existence on the frontline of a civil war between the army and anti-government guerrillas.” – Guardian UK. This is a novel about the limits of journalism; it is an incisive exploration of the death of truth in a country of varied corruptions addicted to oil. Oil on Water confirms Habila’s dazzling talent, evident in his earlier novels and reinforces his place as one of Nigeria’s most important writers.